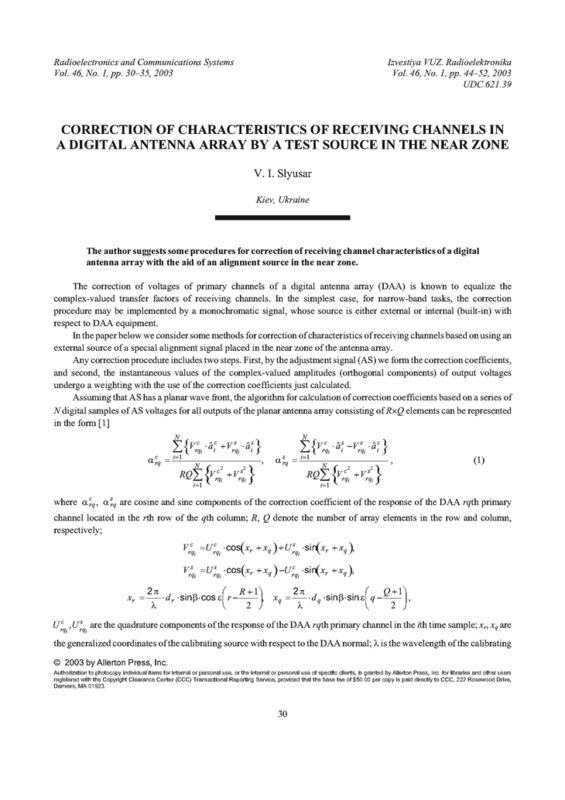 The author suggests some procedures for correction of receiving channel characteristics of a digital antenna array with the aid of an alignment source in the near zone. SLYUSAR, V.I. ; POKROVSKII, V.I. ; SAKHNO, V.F. "A technique for correction of amplitude-phase characteristics of primary channels in a planar digital antenna array," RF Patent No. 2103768, Int. Cl. H01Q3/36, G 01 R 29/10, published 27 Jan 1998, Bull. Izobr., n.3, 1998. SLYUSAR, V.I. "A way of correction of DAA receiving channels characteristics using the heterodyne signal," Proc. of Int. Conf. on Antenna Theory and Techniques, 8-11 Sept. 1999, Sevastopil, Ukraine. Sevastopil, 1999, p.244-245. URI: http://icatt.org.ua/proc/article/view/ICATT.1999.1236177.